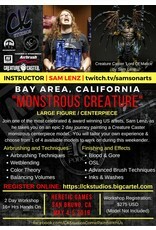 Join one of the most celebrated & award winning US artists, Sam Lenz, as he takes you on an epic 2 day journey painting a Creature Caster monstrous centerpiece model. You will tailor your own experience & choose from 1 of 4 available models to work on during this weekender. This fee goes directly to Heretic Games. Host fee is $25, at the door is $30.